Welcome to issue 139 of the Bootleggers Buzz! Buzz time! It is incredible, but yet another week has passed and thus it is time for me to press the 'Publish Issue' button and release this Buzz. We are nearing issue #140 and if I look somewhat further in the future I can foresee the release of issue #150, which will of course be reason for a Buzz contest in order to celebrate the event. However, first things first. Before we can celebrate issue #150 we still have eleven issues to go, and to get back to the main subject there is the current issue of the Buzz; issue 139! A rather quiet week, this week. Or well, that might depend on what one would call quiet. Contrary to past weeks in which the statistics page saw crews come and go as if it was nothing there were 'only' two crews that disappeared from the page this week. The Deadly Alliance was insided by The Syndicate after making demands of which The Syndicate felt they should not have been made. After that The Syndicate bit the dust as Haer from Club Boogie felt like throwing a party and shot the only two Boss+ accounts the crew had. The result? The uprising of The Lege... oh no, wait. The Heroes. It seems we have heard of heroes and now we are actually able to witness heroes, live, here on Bootleggers. Although a week too late, for which we of course apologize, the Buzz also got into the appearance of Twisted Soldiers and the wipe of Nirvana that was needed for the new crew to get onto the statistics. While on the subject of shootings, The Invisibles also shot a fair amount of players at the start of this week. It almost seems to become something that can be called usual. The Invisibles strikes again. And again, and again, and who knows? Maybe the crew will show us more shooting in the future. For now, the players the Invisibles members call rankists will want to watch their backs, because they are being watched. Enough about the wipes and killings. Let us move on to subject that contain less violence. Our weekly segments! Usually I do not beat around the bush and simply state which segments are in this issue, but I will not do that this time. Why? You may ask. Because an old segment returns in this week's issue. With Blood Line Killahz being the first crew, the Buzz will once again feature 'Crew of the Week' every week until all crews have been reviewed. The segment changed a little but still covers all the information it used to, and maybe even a little more. Apart from our new segment we offer you 'A Year Back', 'The Weekly Flash' and 'Bootleggers Game Statistics'. Hopefully you will enjoy all our weekly segments, and remember that feedback is always appreciated. We stopped actively searching for writers, but nevertheless those who are interested may still submit an application. Who knows? 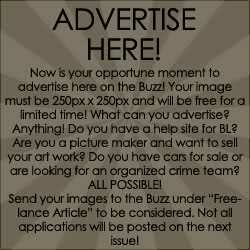 If you write a good article you might still find yourself being offered the digital pen of the Bootleggers Buzz writer. In addition we would like to ask every applicant who got killed and has not received a reply regarding the application to resubmit it. This is necessary as we are unable to track new accounts. That would be all for my Editors Note. Everything was covered for as far as I am concerned, so that leaves you to do one more thing: Enjoy our newest Buzz issue! I will be back next week, and hopefully so will you. Until then, stay safe and take care! Many players on Bootleggers would not be where they are today if it wasn't for Help Sites. 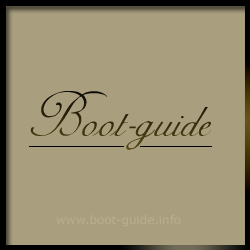 The Buzz conducted an interview with Sean, owner of a relatively new Help Site called Boot-Guide. Earlier this week, Nirvana found itself the victim of a crew takeover, courtesy of Twisted Soldiers. We were able to catch up with the boss of Nirvana, LongRoadToNirvana, for an interview. Welcome to the Weekly Flash. This article contains the highlights of the previous week and news that wasnt covered in one of the other articles. If you have any suggestions for improvements, feel free to contact the Buzz. After having been in the dark cellar of the Buzz for quite a while, Crew of the Week is shown the light of day once again, starting this week with the Blood Line Killahz! The Bootleggers Game Statistics is a weekly article, which will basically contain data of the past week. State Dons, crews and various other statistics are being featured in this article. Check out the state the game was in a year ago. It might surprise you how long ago some events were that still seem so close. Do you have a perfect memory? Check it out, maybe you can still recall it all. Unless you have been living under a rock the past few weeks, you must have noticed The Invisible's battle against 'rankism'.